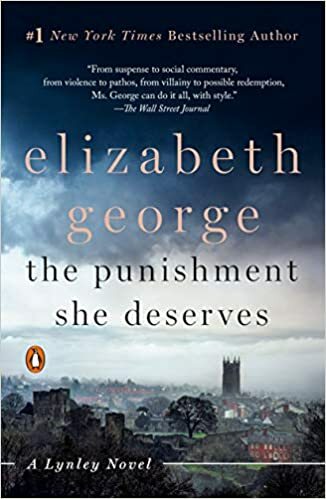 Now in paperback: The Punishment She Deserves by George – Joyce's mystery and fiction book reviews with some non-fiction too! I have read every novel that Elizabeth George has written, starting with A Great Deliverance. I felt that, in recent years, the books were not nearly as good as their predecessors. I thought about giving this one a pass and am very glad that I did not. Ms George was in good form all the way through this almost 700 page novel. Ostensibly the story is about what happened to a young man, Ian Druitt, a church worker, who dies while in police custody. But…this is much more a story about parenting with too much intensity, especially on the parts of the story’s mothers. There is the high up police officer who believes that her son may have committed a horrific crime, the mother who thinks she knows what her daughter should do and whom she should not marry and series character, Isabelle Ardery, whose toxic relationship with alcohol is poisoning her relationship with her children. Who of them is the one who gets “The Punishment She Deserves?” What of the fathers? How much can we or should we control others? How is justice best served? Can police be corrupt? You will consider these issues as you spend time with series regulars Thomas Lynley and Barbara Havers in a tale that, at times, is quite tragic. This book can be read as a stand alone or embraced by series regulars. I very highly recommend it.